On Tuesday morning we left our Aire at Vallon-Pont-d'Arc and proceeded westwards aiming for The Central Massive, and in particular Gorge du Tarn. Our plan was to spend the next couple of days circumnavigating it's boundaries so that we could ensure we'd admired it from every angel - but as often happens, we didn't quite stick to that itinerary! And why was that? Well, our journey was to be about 125 miles - but what we hadn't considered was the roads! As usual John had checked out our route on Google Earth, and as most of them had a white line down the middle (indicating that they were double lane) he thought we'd be OK- however, that wasn't quite the case for the middle half of our trip! Now, I like sums 😁 and you would think that the addition of 2 lane widths of road would be plenty wide enough even for us - well, in quite a lot of places one of said widths just about equated to the girth of a big motorbike - so for over 30 miles in the early part of our journey T4rdis2 had to straddle the white line, and as there were big gullies on either side of the road we'd have been in deep 💩💩💩 if anything had come the other way - luckily we only met about 7 cars and 3 of them were parked! And then came our trip along the floor of the spectacular Tarn Gorges! 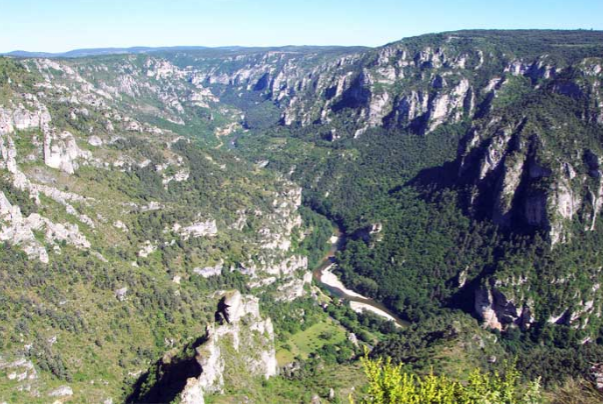 For millions of years the Tarn and it's tributary the River Jonte have eaten their way down through the limestone plateau of the Cevennes, and this erosion has created a sinuous forked canyon that is 33 miles long and nearly 1,300 feet deep in places. 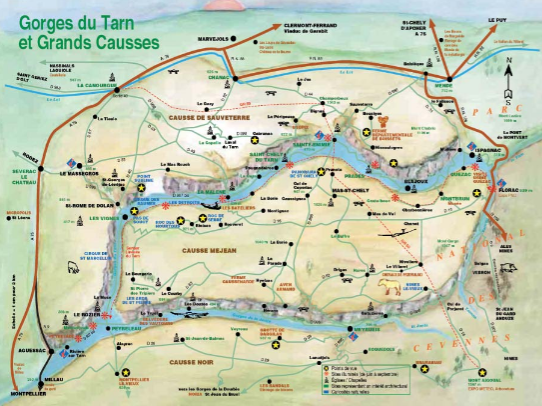 The UNESCO listed gorges are flanked by contorted jagged rocks that loom over the road, and for most of the way, as you would expect, the route keeps company with the flowing water of the River Tarn. Additionally, within the gorge there are 19 chateaux that were built between the 10th and 13 centuries, but we only managed to catch this one - Castelbouc - the ruins of which stand on a rocky peak near the beginning of the Gorge towering over a small village. The views within the gorge were truly magnificent, but parking spaces were a bit like hens teeth, and once again, John's attention had to be fully directed at the narrow sinuous road which had lots of tight squeezes both in width and depth - low tunnels and overhanging cornices seemed to loom around many of the blind bends! And at one of the bends in particular we very nearly came to grief! We met another motor home coming the other way so John squeezed into the side as much as possible and then stopped. But the other driver must have thought he had enough room to get through - evidently not - as his back end passed ours a loud scraping noise reached our ears, - luckily for us it was his rear near side grating against the wall - ouch, that sounded expensive £££££! 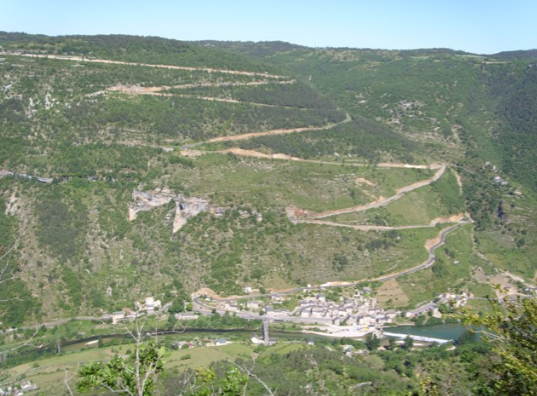 Then all that was left for us to do was to climb out of the canyon via the very steep Col de St Rome de Dolan and head for our designated Aire in the town of La Canourge. By the time we got there John had been driving for nearly 6 hours - mainly because our speed was very limited due to the arduousness of the roads - so as you would imagine he was well and truly ready to put his feet up. And me, well my excuse for being tired was the fact that I'd had so much adrenaline pumping though my veins for most of the day! Anyway, on Wednesday we were originally going back to the Gorge to drive down the opposite side, but quite understandably, John said he'd had enough of 'tight' roads, and additionally we realised that we'd nearly ran out of LPG (gas). Also there was a very strange dampness in the air - a phenomenon that we hadn't experienced for the last 6 weeks! So when we considered all of the above we decided to hatch out plan B and take a short drive to the town of Marvejols to refill our tanks - however, when we got there the chaps on the left were trying to send us on a diversion - to Cockermouth in Cumbria - it was only 1475 km! 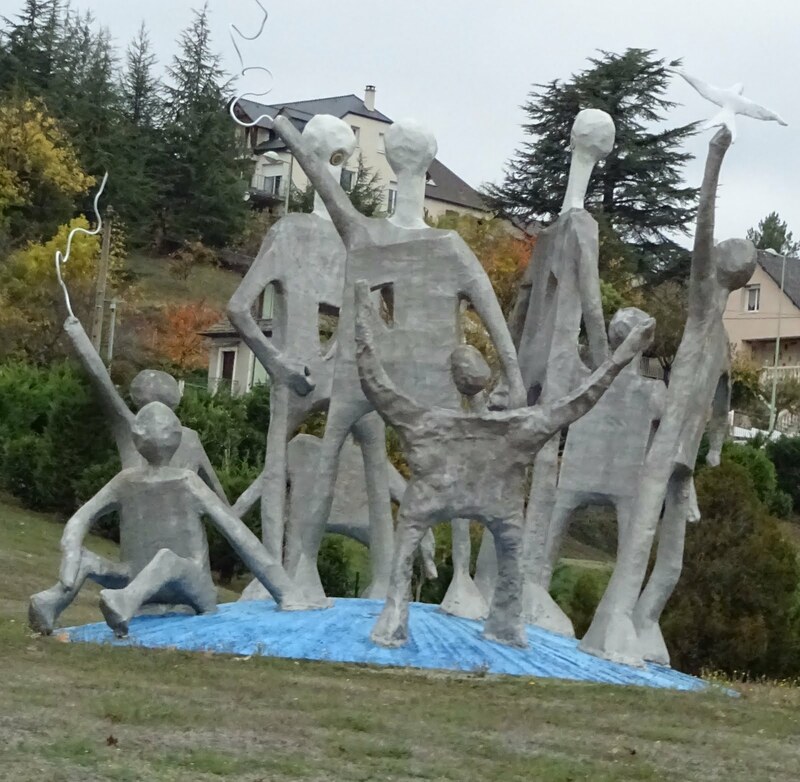 Anyway, we weren't having any of that, so once our mission was accomplished we headed on to the historic town of Mende where we planned to stop for lunch and have a wander amongst the locals who are apparently known as Mendois! However, by then the rain was bouncing off the windscreen so plan B was shelved and C was put into action! We decided to have a little holiday and take the rest of the day off so we headed for an Aire at Lake Langogne (which almost sounds as if it should be in Wales), and there for the small sum of 10 euros we had the luxury of electric hook up so we could warm some water for a hot shower - what luxury 😂😂😂! This morning we woke to the gentle drumming of rain on our roof, but despite that, the autumnal picture that met our eyes when we pulled up our blinds was quite delightful! The woodland floor was carpeted with a bright orange rug, the falling leaves were whirling around us in mini tornados and in the huge lake loomed mistily in the background! And because it was so lovely it was quite difficult to tear ourselves away, but our time in France is running short now so our decision to continue our journey Northwards was soon made! And really I haven't got much else to say about today - it was just a long drive (150 miles) over the gently undulating plateau of the central massif, but this was undertaken on excellent roads so our journey only took a little over 3 hours even with stops! It was much nearer than it looks on the pic! However, along the way T4rdis2 did have a very close encounter which would have been very unpleasant indeed if contact had been made. There we were, driving along minding our own business when all of a sudden a young sleigh puller 🦌 darted out from a deep gully and was within inches of our right front bumper - I'm not sure which of the 3 of us was more startled but luckily the little chap's cloven hooves must have had excellent brake pads because he managed to halt his progress and change direction and thus avoided certain death! If we'd hit him at 43 mph it wouldn't have been a pretty sight! Anyway, after that it wasn't to long before we arrived at our nights free stopping place which was a small Aire in the town of Randan, and once we were settled it was debate time concerning where we should go next. John had earmarked a couple of lake areas in the Morvan region, but because we've had our wings clipped and can't really use our e-bikes (John's is making a horrible clunking noise) we couldn't decide if that was a good idea or not! 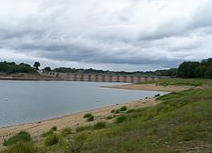 However after further investigation we've settled on a Reservoir near the town of Chaumard, so fingers crossed we'll find something entertaining there! Anyway, we'd done enough driving for the day, and we'd I'd also got a bit of cabin fever after hardly straying from our home for the last 3 days, so it was time to make the most of it, don our walking boots and get off out in the fresh air! We walked for about 4 miles along the forested lake side, and really it was quite pretty and mood lifting as we watched various birds which included a woodpecker flitting about! And then once we about turned we could see T4rdis2 nestled in the distance at the lake side waiting to welcome us home, and by the time we got there the sun was peaking out and shining over the water - beautiful! Tomorrow we'll move on again - destination yet to be decided!